President Recep Tayyip Erdoğan has slammed those who invite people to street protests like Yellow Vests, in an apparent reference to Turkey's main opposition leader and a news presenter. "There are Yellow Vests in France, and the [main opposition Republican People's Party] CHP is also there. The Gezi Park protests were held and Mr. Kemal [Kılıçdaroğlu, the CHP chairman] was also there. They are again in preparation [for such protests]. But you are waiting in vain. We will make you pay a heavy price," Erdoğan said in a speech during an inauguration ceremony in the western province of Denizli on Dec. 15. 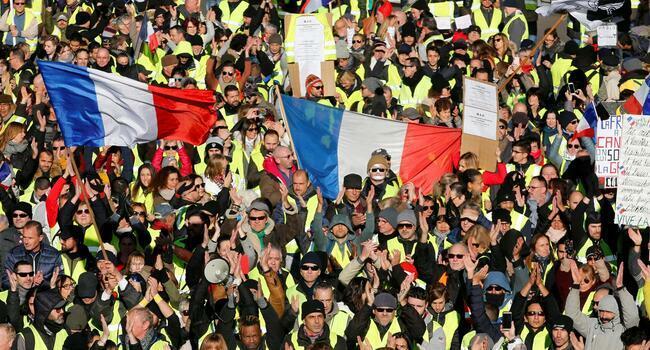 Thousands of protesters hit French streets in the fifth Saturday of Yellow Vest demonstrations on Dec. 15. "They are inviting people to the streets. What a shame! One of them, an impertinent and impudent man, call people to the streets from television screens. The judiciary will respond accordingly," Erdoğan added. "Do you think it is Paris? Everyone learned a lesson from the Gezi incidents." Private broadcaster Fox TV's news presenter Fatih Portakal had become the target of pro-government social media users after he presented a segment about the Yellow Vest protests in France on his daily news show this week. Criticizing the Turkish government, he had said that "peaceful protest is a natural right but could not be practiced now because the people fear." Erdoğan's statement came three days after a similar warning from Nationalist Movement Party (MHP) chair Devlet Bahçeli, whose party remains in a de facto alliance with the Turkish president's ruling party ahead of the March 31 local elections. “I am noting in advance that if there are any Yellow Vests terrorism wannabes, they will pay a heavy price for it. Those who wear a yellow vest should brace for sleeping naked. It is no joke,” Bahçeli had said in a written statement on Dec. 12.